將來自多個 IP 攝像機的視頻直接傳輸到您的電腦。目前支持來自領先相機製造商的 2000 多種不同的 IP 攝像機型號。它包括安訊士，佳能，D-Link，Foscam，松下，Mobotix，Pixord，索尼，東芝，Vivotek 等等。如果您的相機或型號沒有在我們的應用程序中列出，您可以向我們的技術團隊發送請求。幾乎所有的 USB 攝像頭都可以使用 IP Camera Viewer. 您可以同時控制和查看多達 4 個攝像頭。使用這個輕量級的應用程序，從多個攝像頭獲得實時預覽。 IP Camera Viewer 的集中式攝像頭和佈局管理允許您在一個屏幕上從多個遠程位置查看您的攝像頭。您可以根據您的安全需要更改攝像機的佈局和預覽佈局. 同時控制和查看多達 4 個攝像頭使用 IP 攝像頭以及攝像頭支持 2200 個攝像頭型號和計數在多個監視器上查看攝像頭平移 / 支持許多網絡攝像機的傾斜 / 縮放（PTZ）功能即使攝像機不支持，也可以進行數字縮放調整實況攝像機的方向調整 IP 攝像機的圖像設置從 IP 攝像機捕捉 JPEG，MJPEG，MPEG- 4 和 H.264 流在網絡上搜索網絡攝像機收聽網絡攝像頭的實時音頻導出和導入相機的個人設置注意：演示版本中的功能有限. - Improved Stability: The CPU memory utilization is optimized which leads to more responsiveness of application. - Support for ONVIF cameras: IP camera Viewer auto detects all the ONVIF cameras in your network. Most new IP cameras are ONVIF-compliant and these can be automatically detected and can be easily added by IP Camera Viewer. - Support for new IP cameras: Support for 19 IP cameras including new brands like Ctronics, Hesavision, iBaby, Kkmoon and KTNC. Please see our full list of supported IP cameras. - Better Performance: You will notice a considerable performance improvement when using IP Camera Viewer both in terms of CPU and memory utilization. - All-new UI experience: A modern look that still maintains the application's simplicity. - Find your IP camera: Faster detection provides brand and model, IP address and port number of the of UPNP enabled cameras on your LAN. 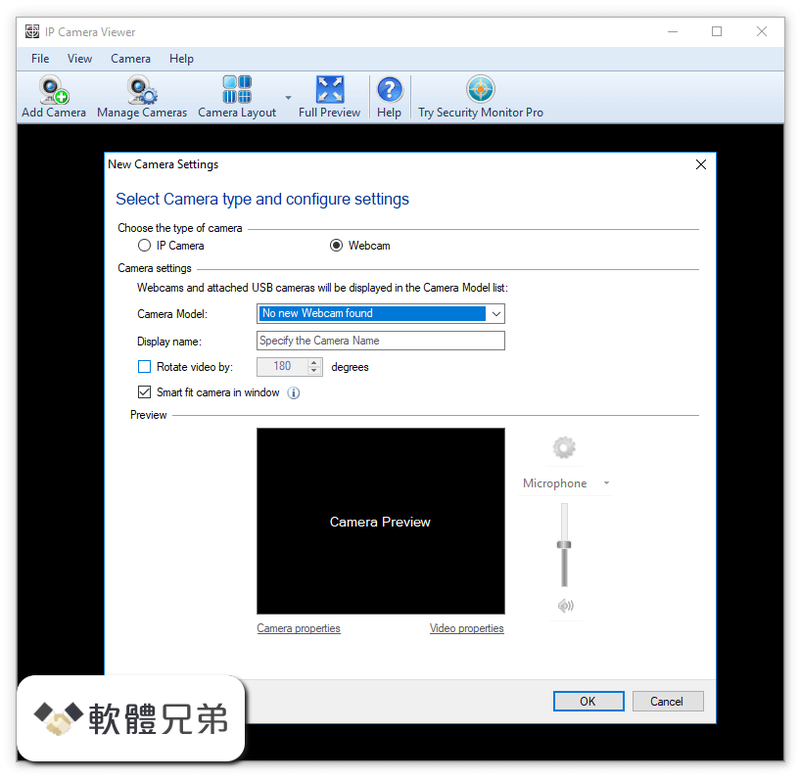 - Camera Preview Positions: Detach the camera previews from the main interface and arrange them anywhere on your desktop, even other monitors. - Listen to audio from Webcams: Most Webcams have a built-in microphone. Monitor the camera preview as well as listen to live audio from the viewing area. - Resizable camera previews: The camera previews are automatically resized to fit your screen. When resizing, the aspect ratio is maintained so your images are not streteched or compressed. - Date-Time stamp: The current system date-time can be displayed on your camera preview. - Support for new Video Servers and IP cameras: Support for 22 IP cameras including new brands like Acromedia, Aquila Vizion, Insteon and Security Labs. - Support for IP Camera models: Support for new IP cameras from ATHome, Asgari, Avacom, Cadyce, Camsecure, Easy Home, Loosafe, Nexxt, and many more. 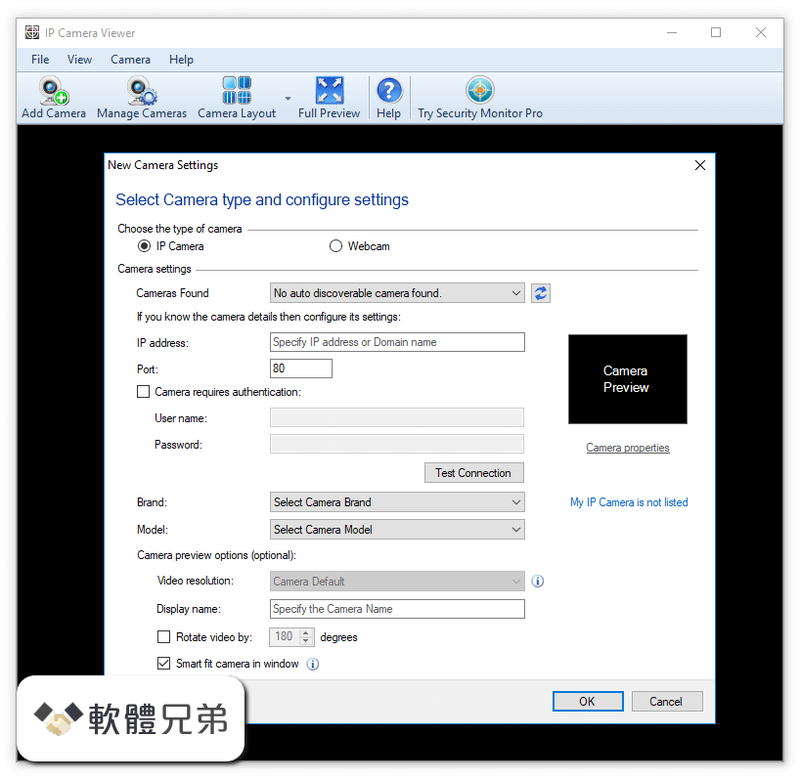 - Windows 8 compatibility: IP Camera Viewer has been successfully tested to work on windows 8 operating system. - Support for new IP Camera models: Support for 24 IP cameras. It includes Ameba, AVS, Aztech, Bluestork, Grandstream, GVI SECURITY, Hisilicon, Kinson, Niceview, Nilox, Smart Witness, Speco, Storage Options, Sunluxy, Tomtop and many more. Please see our full list of supported IP cameras. - Automatic updates: Get automatically notified when new update of IP Camera Viewer is available. - User-Friendly Interface: Quick and easy access to all the important features of IP Camera Viewer. - Support for IP and USB cameras: Now you can view both IP and USB Cameras. - Added support for popular camera brands: More than 1500 different IP camera models from leading camera manufacturers are supported. It includes Axis, Canon, D-Link, Foscam, Panasonic, Mobotix, Pixord, Sony, Toshiba, Vivotek and many more. - Multi-camera Preview Layout: View multiple cameras simultaneously on your screen by choosing different display layouts. - Pan/Tilt/Zoom (PTZ) support: Control your IP camera with our advanced PTZ tool. It includes optical and digital zoom. - Backup and Restore: You can easily backup your individual camera settings for easy transfer to other PCs. Download video monitoring software: IP Camera Viewer. 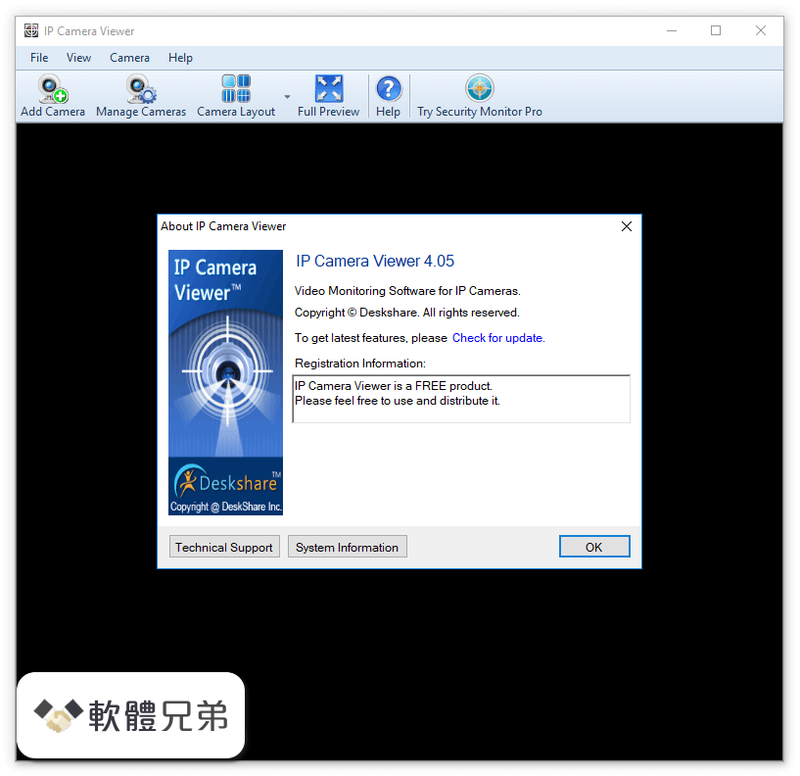 Free IP Camera Viewer allows you to remotely view live IP cameras on your PC&#39;s or Laptops. ... Monitoring Software for IP Camera. Version: 4.07 What&#39;s New?